Last weekend my brother and I headed along to Scone Palace to witness the finish of this year’s Rally of Scotland, the penultimate round of this year’s Intercontinental Rally Challenge. Scone Palace is only about half an hour from where I live, and five minutes from where my brother lives. So it seemed silly not to go. I have a bit of an on–off relationship with rallying. I used to enjoy watching the World Rally Championship a decade ago, when Channel 4 had some excellent coverage. But even then, it was never as satisfying a television spectacle as watching circuit racing. Often there is no footage of the major incidents in a rally, and you just have to take people’s word for what happened. Sometimes there is footage, but taken by a spectator at the quality of a You’ve Been Framed camcorder calamity. This sketchy experience must be amplified if you are standing in the middle of a stage, somewhere remote, in the freezing cold, Thermos in hand, bobblehat on head. A car whizzes past, then you wait for a minute or so until the next one comes. All part of the experience I guess, and something I want to do in the future. Another slight issue is the fact that the stage you attend is only a small fraction of the overall rally. If you attend a later stage, chances are that the rally has pretty much already been decided. 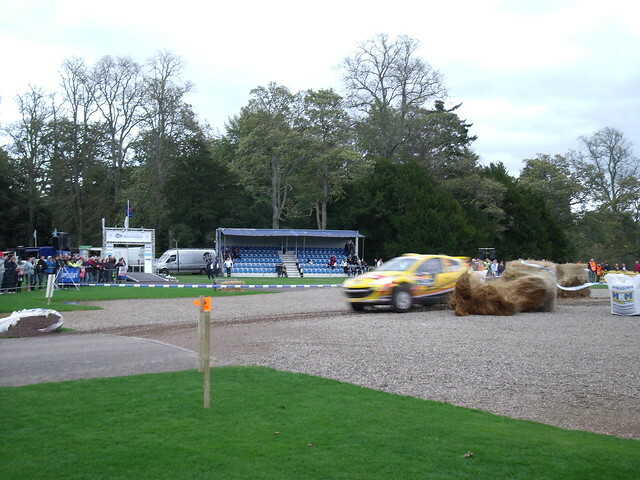 Prior to Scone Palace, Andreas Mikkelsen had a 30 second lead. That is difficult to overcome in a couple of two minute long stages! 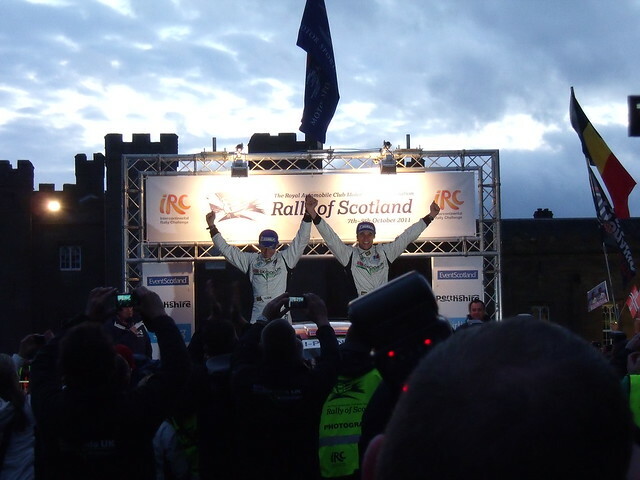 But Mikkelsen, driving for the Škoda UK team, was the chosen man for the win. 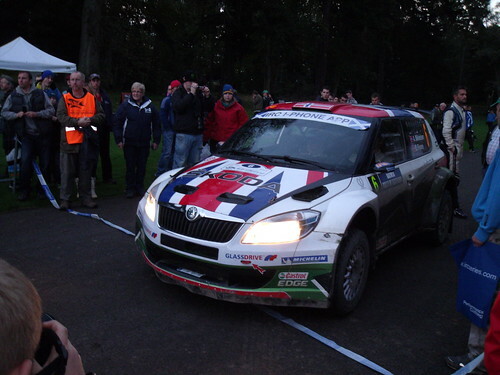 So much was this the case that when we entered the area around Scone Palace we were approached by a girl handing out Škoda flags that said “Go Andreas!” She said that the flags were “for when he wins”. I raised my eyebrows as there were still two stages to go, and anything can happen in rallying! But it must be said that as a PR exercise it worked out pretty well. Most people had these Skoda flags and were planting them in the grass. Couple this with the several representatives from Škoda staff, and you would be forgiven for thinking that Scone Palace is in the Czech Republic. Škoda had conquered Scone. 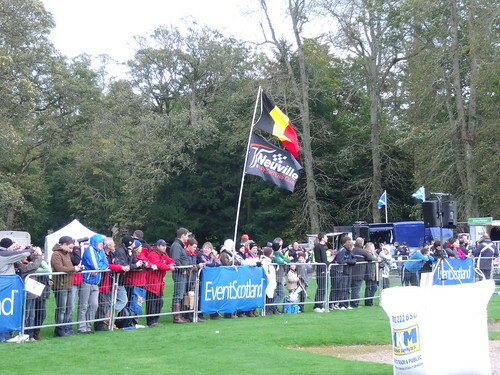 Having said that, the Thierry Neuville Supporters’ Club were also there to show their support for the Belgian Peugeot driver. Škoda’s nice flags could have backfired. Guy Wilks was the perfect demonstration of the fact that anything can happen in rallying. He has had a pretty rotten season, and a pretty rotten Rally of Scotland. He hit a gatepost on the final stage and failed to finish. 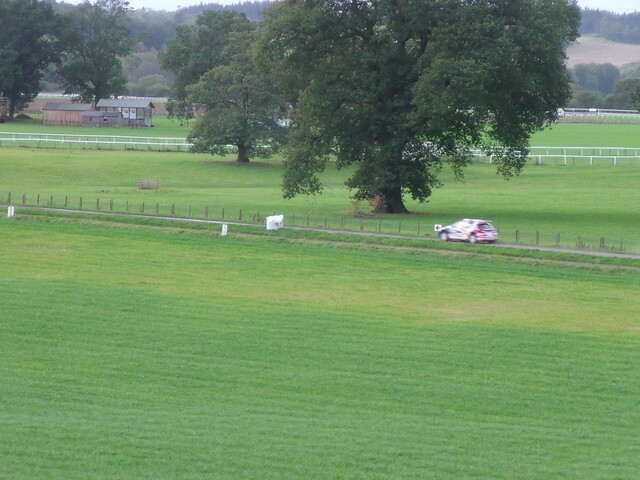 As rally stages go, Scone Palace is compact and spectator-friendly. This stage was just two minutes long, and was repeated in quick succession. It also doubled up as the finish. So there was a reasonably large crowd, and commentary from Rally Radio on the loudspeakers. Aside from the relatively sanitised main spectator area, there was a bit of scope to wander around and see further along the stage from a neighbouring field. Overall, I really enjoyed my trip to the rally. It was quite a different experience to the World Series by Renault, which I attended a couple of months ago. The really striking thing was the sound of the cars, which is totally different to the TV. Something else, that I didn’t get so much at World Series by Renault, was the smell of the fuel wafting slowly up after a car has gone by. Worryingly, I felt myself starting to crave it! After the rally had finished as the front-running drivers were preparing for the podium ceremony, the access was amazing. 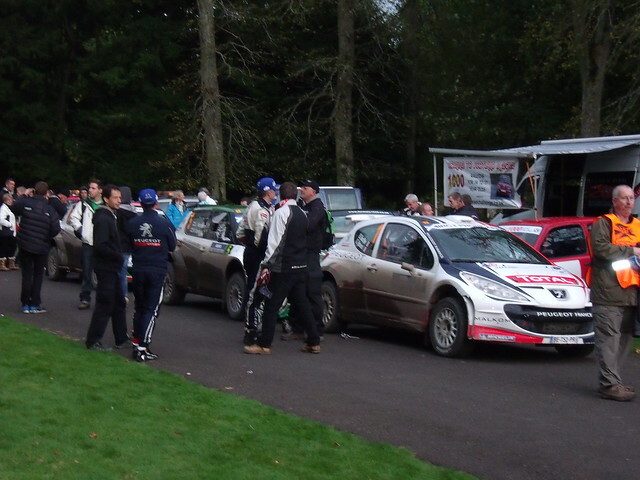 Top-class international rally drivers were just standing around chatting, and their cars were right there for all to see up close. It is the first rally we have ever been to, and we certainly enjoyed ourselves. We plan on attending next year, perhaps even going to a stage further afield if we can plan ahead. And congratulations to Andreas Mikkelsen. It may not have been clear from what I wrote above, but you cannot begrudge him this victory. He has come so close twice this year, only to be denied his first IRC victory. Then he came to Scotland and this time it was his rally.